What a beautiful way to display your jewelry or ornaments! These trees feature many branches to hang necklaces, bracelets, or ornaments as well as an adorable little nest, perfect for rings and earrings or other baubles! 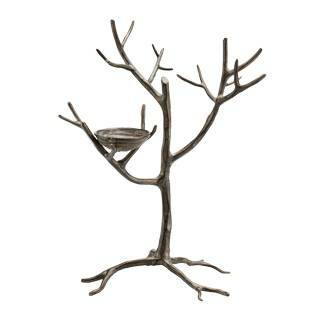 Made of aluminum, our Nest Tree measures in at 15" H x 11.5" W x 8" D. Perfect for adding a little flair to your room.